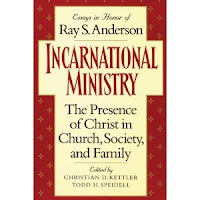 The book Incarnational Ministry, the presence of Christ in Church, Society and Family contains an essay by Christian Kettler, The Atonement as the Life of God in the Ministry of the Church. Kettler notes that God's ministry (his doing) expresses his being as the God of love and grace. As we (the church) participate with God in his ministry, we learn more about his being. In this way, ministry precedes theology. However, the reverse is also true - our participation with God in his ministry grows as our understanding of his being (our theology) deepens. 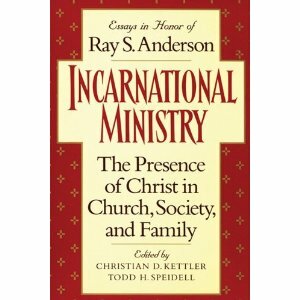 This dynamic interaction of ministry and theology is liberating, setting the church free to "determine its ministry based on who God is and what he has actually done, rather than what would sell in the marketplace of ideas and religions and in 'self-help' books" (p60). This being true, we ask, what is God's ministry? The answer has many facets, but a primary one is that God's ministry is the ministry of atonement. But how do we participate in that? Here it is critical to hold a Trinitarian, incarnational understanding, which views the atonement as God's ministry of healing - the healing effect of God's own life being communicated to humanity through the life, death, resurrection and continuing intercession of the incarnate Son of God, Jesus Christ. The atonement is thus a past, present and continuing, Christ-centered, Trinitarian event. Said another way, Jesus is the atonement, and he does (ministry) what he is (theology). The church shares in his atoning life and love by participating with Jesus in his ongoing ministry in the power of the Holy Spirit to communicate the atoning life of the Father to all people. To illustrate the nature of the church's participation, Kettler tells of a woman named Sondra, who at age 43 is wrestling with the effects of being sexually abused by her father when she was young. How might God's ministry of the atonement be extended to Sondra through the ministry of the church? In answer, Kettler makes five points about God's ministry of atonement and the nature of our participation as the church. The atonement begins here. The Father's heart is one of love toward his creation, expressed in his desire to rescue humanity from its own devices. Sondra needs to know the true heart of the true Father, even as she struggles with her memory of her sin-filled human father. The Father's love is seen clearly in the incarnation of his Son ("God so loved the world that he gave...). Indeed, "the incarnation of the Son truly reveals the Father" (p62). Unfortunately this fact is often obscured by penal (or forensic) theories of the atonement, which say that the Son paid the penalty for humanity's sins in order to assuage the Father's wrath and revulsion toward sinners. This approach denies the essential unity of being and will shared by the Father and the Son (with the Holy Spirit). Sadly, Sondra, like many Christians, views God (i.e. the Father) as an "angry judge." Where in this image is the solace and comfort she needs from her heavenly Father? It is absent. How sad, for her true Heavenly Father, in his love for Sondra and for all humanity, gave his only Son to rescue us all from the ravages of sin (including our own and those of others, like Sondra's human father). "The God who meets Sondra in the face of Jesus Christ with forgiveness and mercy is the same as God the Father. There is no 'God behind God.' As [Scottish theologian] McLeod Campbelll states, there is one divine purpose of love seen in the relationship between the incarnation and the atonement" (pp62-63). This love of the Father, revealed clearly and decisively in Jesus, keeps us from making the grievous mistake of "reading into God any [false] idea of God, including our human ideas of 'father'" (p63). This will be of particular importance to Sondra and all whose experience of their human father was of an abuser and not of a compassionate, protective and loving father. In the incarnation of the Son, humanity participates in "the history of the inner life of His Godhead" [quoting Barth]. God communicates his own life in order to heal broken humanity... Healing and reconciliation come when we participate by the Spirit through faith in this "inner life" of the triune God, made manifest to us by the incarnation of Jesus Christ (p64). Where is that life for Sondra? Where is she to find the life of Christ which can begin to deal with the depths of her anguish? [What she needs is] an incarnational place... to begin to be healed. Jesus' presence was such a place for the [original] disciples. The church as the body of Christ, as the community of atonement, should be a place of 'rehabilitation' for all, building upon the accomplished radical surgery performed by the life of th Son lived in our human flesh (p66). Kettler notes that the atonement is not only God's action toward us, but also humanity's response back to God. Here we are reminded of the vital reality of Jesus' vicarious humanity. Because we, as sinners, are incapable of responding to God's love, his Son becomes human and makes the perfect human response on our behalf as our representative and substitute. Jesus provides this human "atoning response of perfect worship, trust, service, and confession of sins to the Father on behalf of humanity" (p67). As Kettler notes, atonement is not simply God saving humanity from sin, death, and hell, but also God saving us for eternal life, with all the fullness of what that means (see p68). For this to occur, Christ was "made like his brethren in every respect," becoming High Priest for us and the expiation for our sin, to the extent of "learning obedience" by his suffering (Heb 5:8; 2:10), which expressed itself in "loud cries and tears" (5:7). This being so, the church can, with joy and confidence, reassure Sondra that the atonement accomplished by Jesus on her behalf "penetrates into every point of [her] existence." Jesus is right now interceding for her - she can be reassured that she is not alone in her suffering, for Jesus identifies with her anguish and in "some mysterious way, the terror, the fear, the guilt the hatred, the shame that Sondra feels for her father is being felt by Christ himself. Her anguish has become his anguish" (pp68-69). Forgiveness of sins is the atoning manifestation of the life of God, motivated by the heart of the Father, taking deep ontological roots in humanity through the incarnation, and perfectly fulfilled by the faithfulness of the vicarious humanity of Chrst (p69). ...through... preaching, teaching, pastoral care, and fellowship. In these acts, the vicarious humanity of Christ continues to live in the church [which is] the body of Christ... The atonement continues to be powerful in the church when the message of forgiveness through the life of God is still proclaimed, even when we cannot believe, even when we need someone to believe for us (p75). Sondra does not need the church to tell her to "become more spiritual" so that she might "forgive and forget." What she needs is to be lovingly, patiently and continuously reminded of the truth of who God is for her and with her (in her past, right now, and forever). She needs assurance that Jesus, in his vicarious humanity, is with her, and believes and forgives for her; thus bringing God's atoning life to her. The church's calling is to help her deeply experience this truth and life, even while being patient with her struggles to do so. As this occurs, little by little, her life is transformed, because more and more, she is able to share in the love and life of God that is hers in Christ.